While doing some post-family gathering cleaning, I came upon the latest issue of the Nevada Magazine January/February 2015 (pp 54). And there it was! 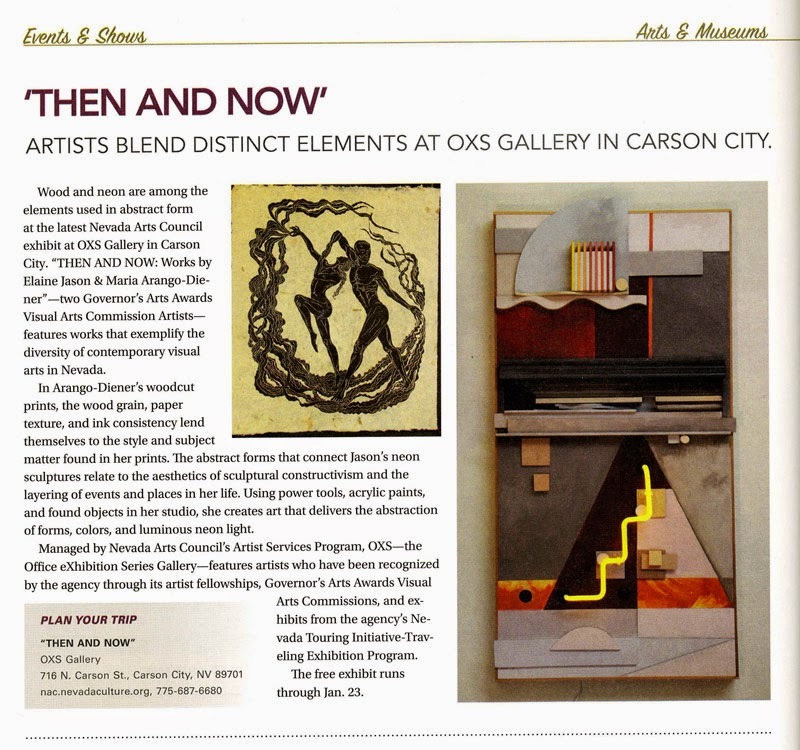 An OXS Nevada Arts Council Exhibit blurb with some of my artwork. 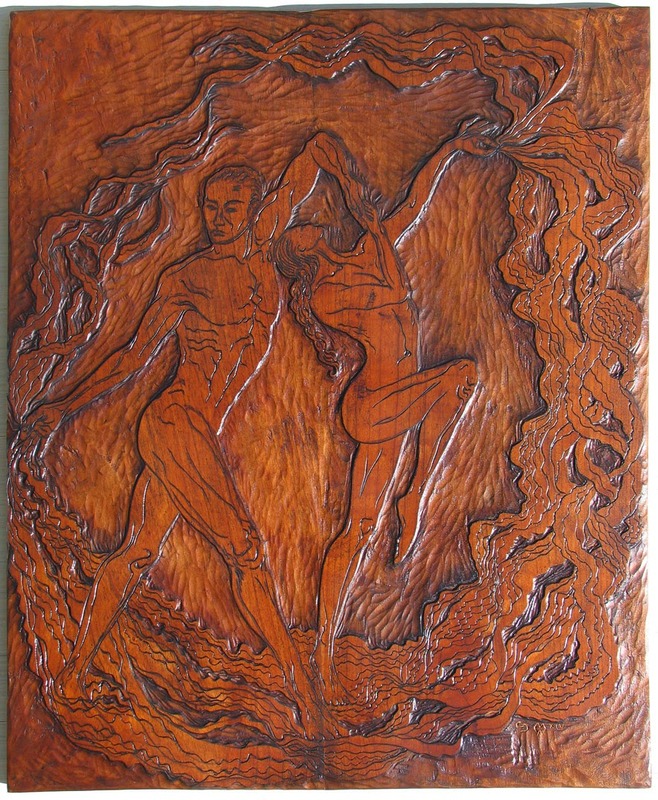 My work is the traditional woodcut with the dancers, a piece called Baile del Sol inspired by one of the many flamenco tunes I play while I work in the studio. Ole! 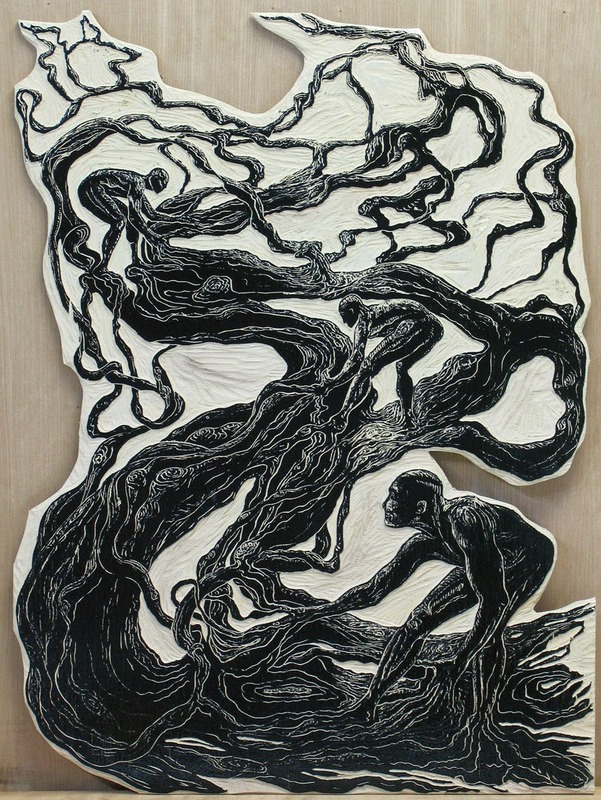 Also showing are other figurative works on paper with the carved woodblocks side by side. 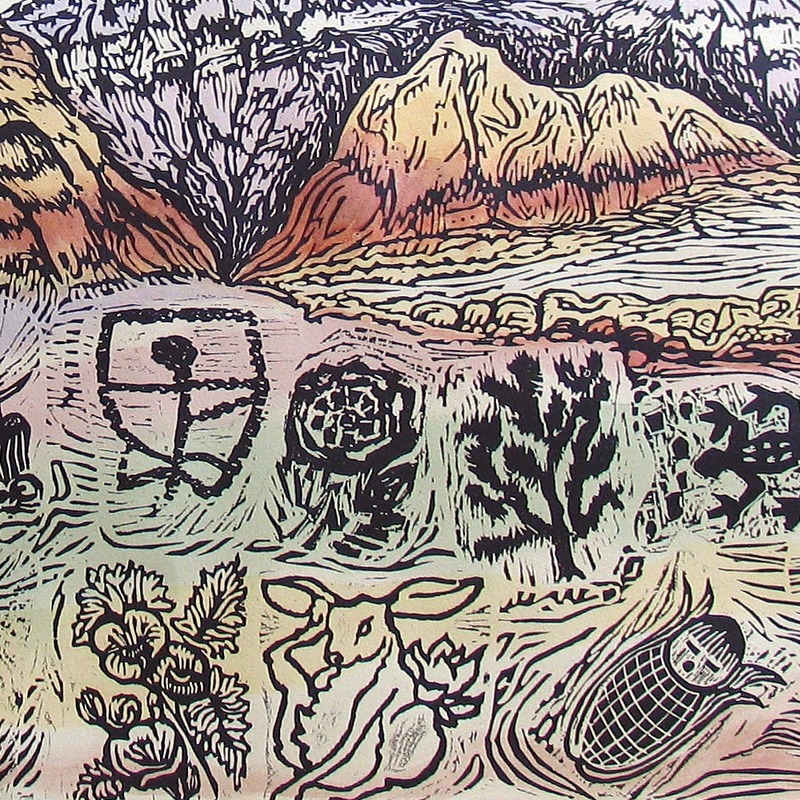 Exhibit is up in Carson City Nevada (Nevada Arts Council headquarters) until the end of January. 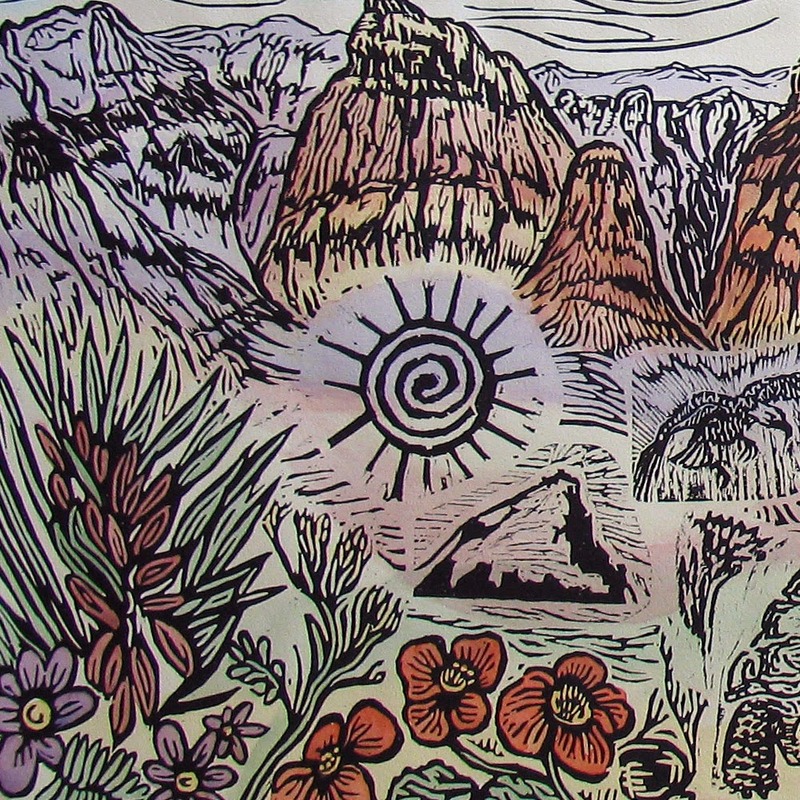 I was summoned to nearby St George Utah by Kris Adler (brave art instructor) to help in printing a puzzle print. Obviously I could not resist being involved in a puzzle print! So I saddled up the faithful steed and crossed desert and mountains through some of the most beautiful country in the American West. After an incredible day of solitude in Zion National Park and a visit with my niece and family and my oh-so-tiny new family member (Dash Awesome Boren), I headed to Pineview High School for a chat with students and a session of ink and fun. 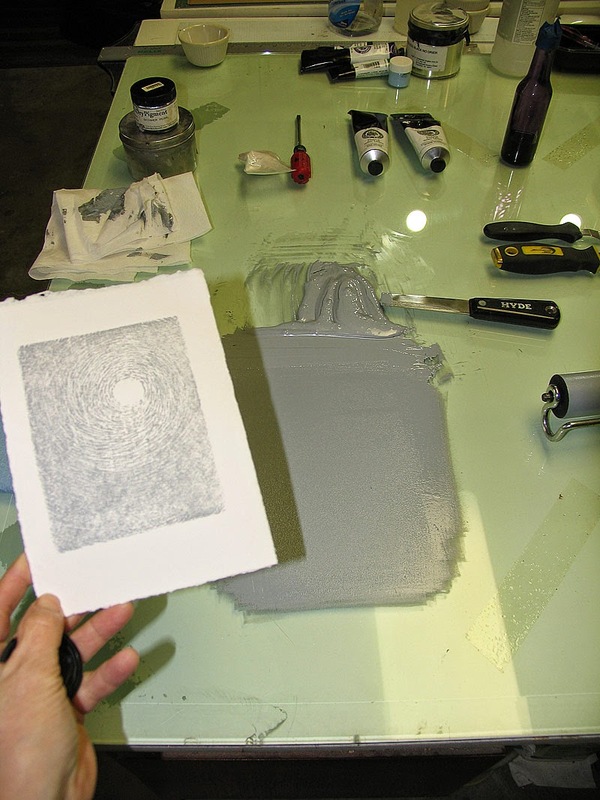 Then we just got down and dirty and proceeded to print the collaboration print from the printmaking class of Fall 2014. I can't believe I actually just handed my $1000 camera to a couple of budding video-photographers but all's well that ends well and I was very impressed with the photos and videos. Videos and photos of the resulting print chaos can be seen in various places, mostly in my YouTube Channel and Facebook Page and some pics in my FB Profile. What can I say, I was tired and couldn't make up my mind where to upload it all. Have fun hunting it all down. Whew! I hope I'm done for this year because there's family coming for a holiday bash and I have to switch to domestic mode. Have a great one everyone! This time of the year, I usually tie up loose ends. After the dust settles from various projects and before my mind races on to the next creative mayhem, I tend to figure out what I need to finish. Shamefully, this year's Chinese Lunar New Year print was still patiently waiting to be carved after being drawn on the block in January. 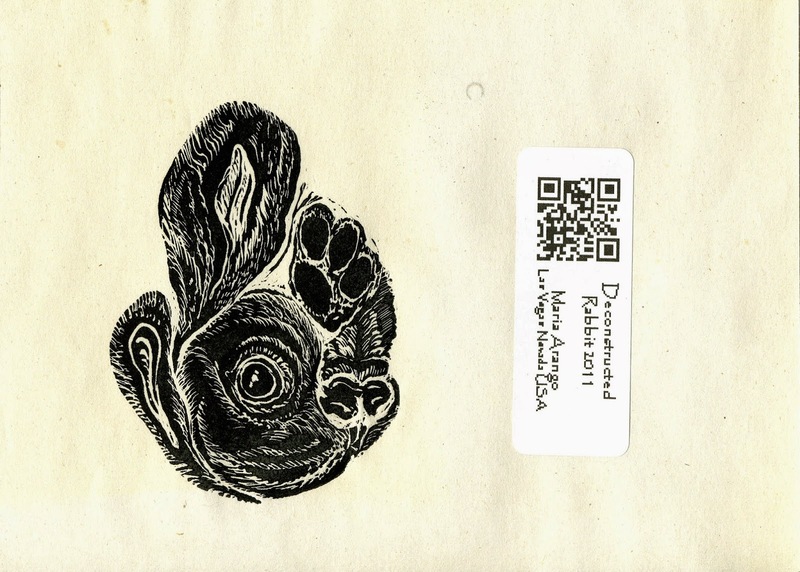 Printmakers, being a generous and somewhat odd bunch, tend to exchange prints for no good reason at all. We do it often just for the pleasure of owning other artist's work. In fact, I will just boldly state that bartering art with other artists is much more satisfying than exchanging art for money. 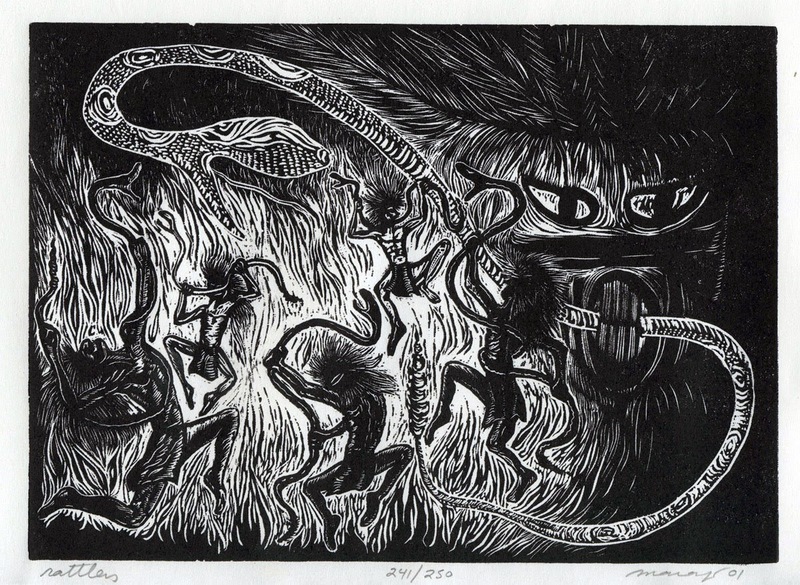 In any case, one of the yearly traditions for the group of happy printmakers in http://barenforum.org is to exchange tiny prints with the Chinese Lunar New Year theme. Every year! Last year I took my Mami on a glorious trip to one of my favorite cities, San Francisco California. On the glorious voyage (sorry for the repetition, the Pacific Coast Highway requires the adjective glorious) we stopped at the Monterey Aquarium. One of the highlights for me were the deliberate and gracious sea horses, dancing their sweet dances with each other; gently and unashamedly wrapping themselves in each other, fluid love...just beautiful. I know that living in the American West I probably should have made some galloping wild mustangs, but that would have been bordering on the normal. 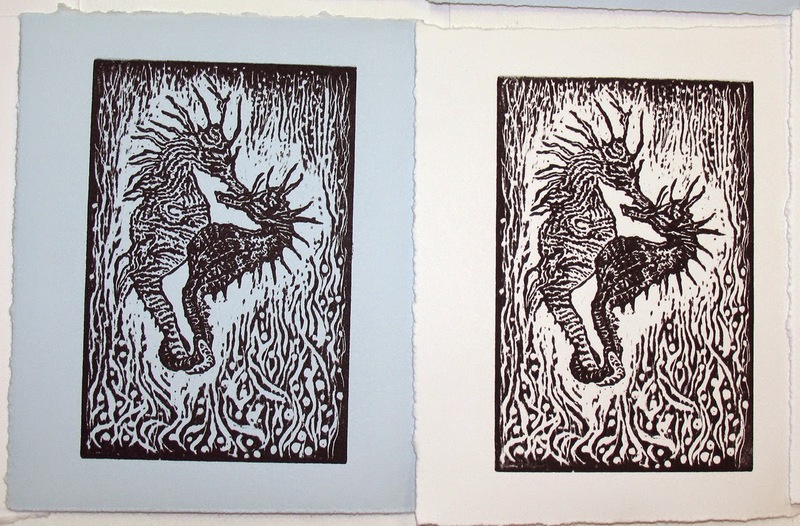 My year of the horse print HAD to be about the sea horses, so here it is Fluid Love, a tribute to these amazing creatures. It's the moooost wonderful time! I confess I love Christmas season. Mostly it gives me a reason to engage in one of my vices, pathological generosity. Any other time of the year people kind of look at me weird but during Christmas season, well, I can GIVE stuff to anyone and they just chalk it off to the spirit of the season. More importantly, I like to give art away which means I get to make art. The past couple of years have been strange and I haven't been myself so I decided to renew a holiday tradition and print some original artworks to give away to a short list of friends and family. 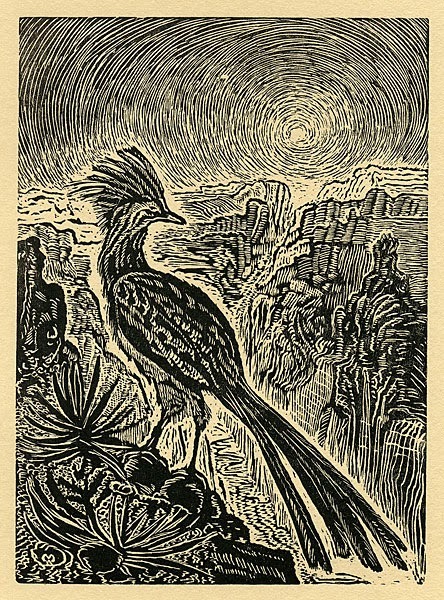 This year, though, I'm starting something new on my Facebook page https://www.facebook.com/1000woodcuts and reaching out to strangers. Keep an eye on that page, a few days and the experiment will commence! Two of my favorite giveaway prints, unfortunately I'm out of stock! 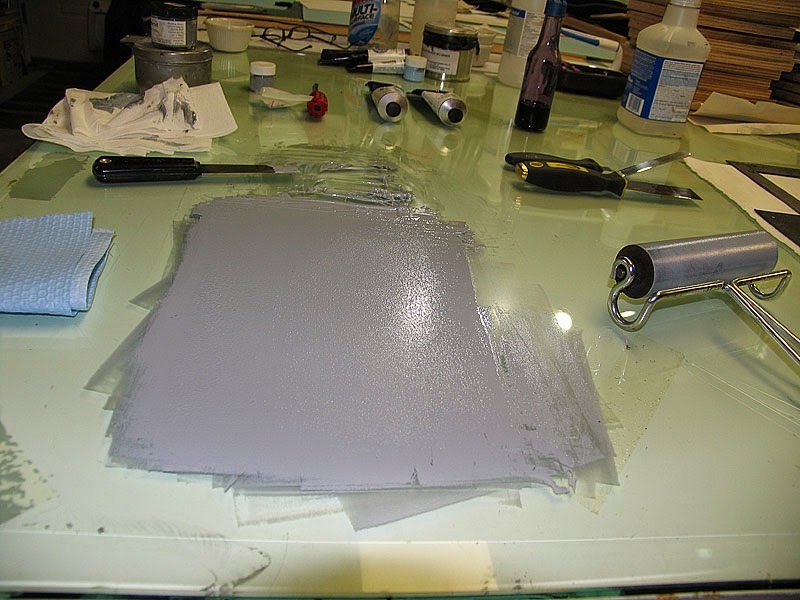 Printing begins with the background, silver, white and pearl dust! The paper is Rives de Lin, an absolutely luxurious white paper with a soft finish and fluffy texture. 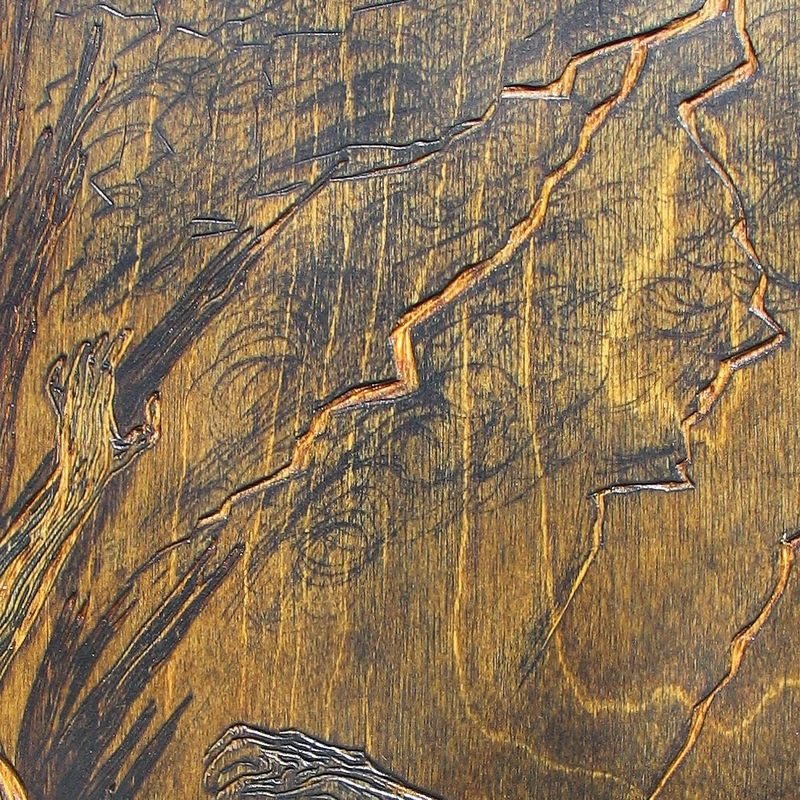 The background block is carved and scratched with rough sandpaper so that it adds to the shimmery feeling of the prints. Here we go! Some blocks, for one reason or another, just look yummy as they are. These last two blocks, one cherry and one Baltic birch, looked pretty good after cleaning off the ink and applying some citrus paint stripper. 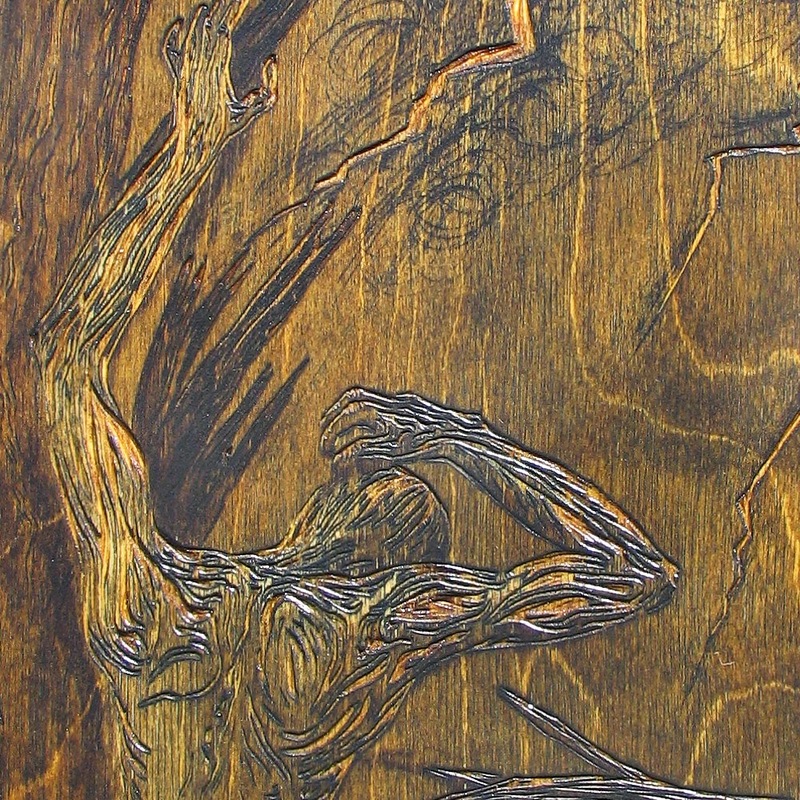 The cherry block I can explain; cherry wood is very tight grained and the ink used during printing didn't penetrate the lows and carved "scars". 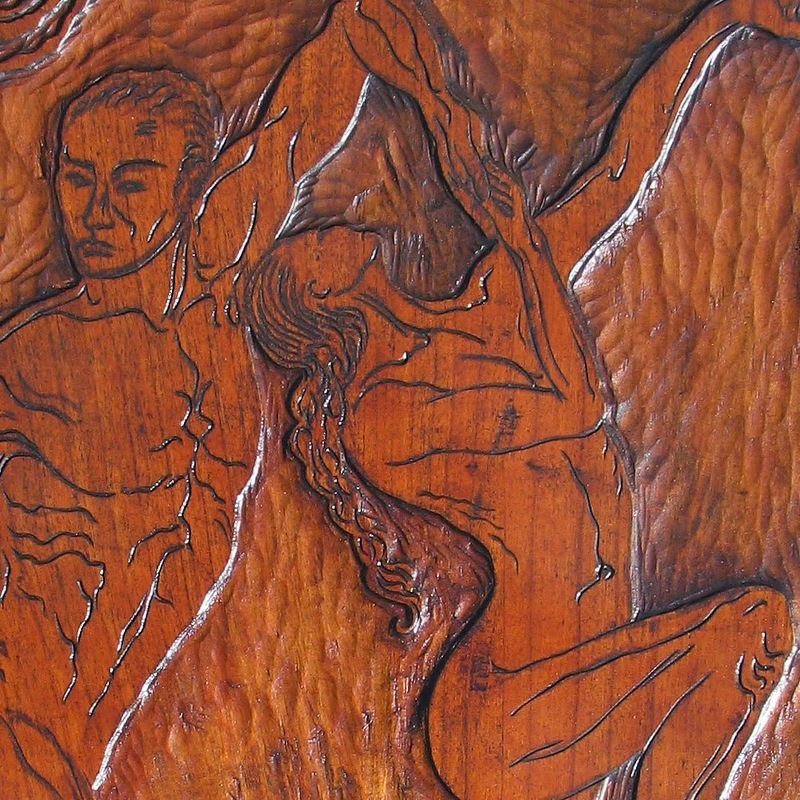 When the ink (and the dancers' clothing, apparently :-)was removed by the paint stripper, the cherry looked just as good as just after I first finished carving. The paint stripper has oils to protect the wood while the chemicals soften the ink (paint, etc. ), so the block was finished. Baile del Sol with details. A little more trouble explaining why some Baltic birch blocks clean up nicely and others don't. But if I recall, I believe I used linseed oil to seal this one before cutting and printing so perhaps that had something to do with the cleanliness. This second block, Uprooted, was grateful enough to clean up nicely and the wood grain shows exquisitely! 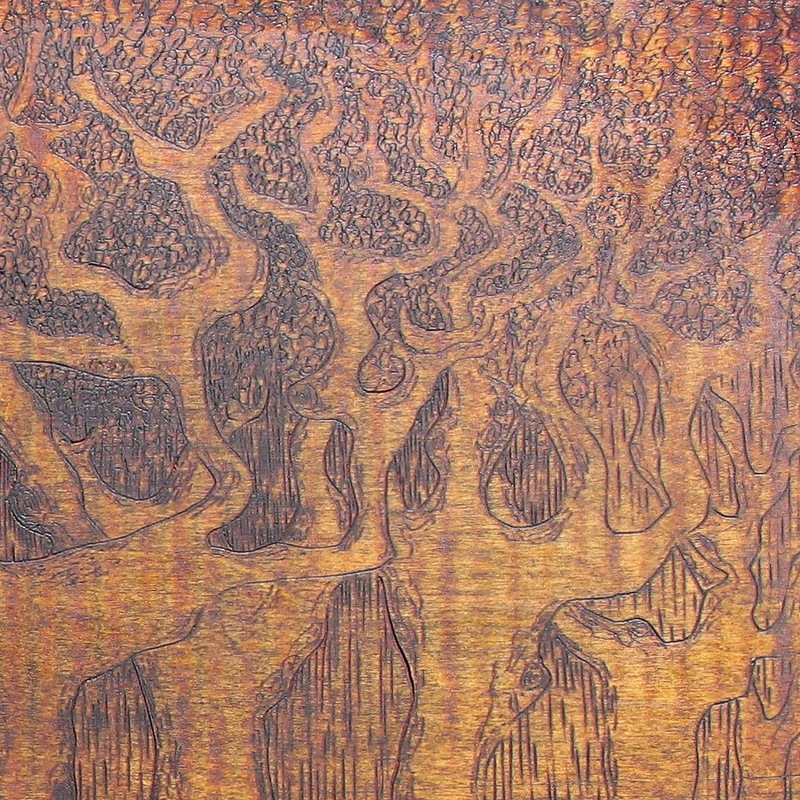 Moreover, the lines filled with the ink residue and show as dark on a light wood background, exactly the opposite as the print. Cool deal! 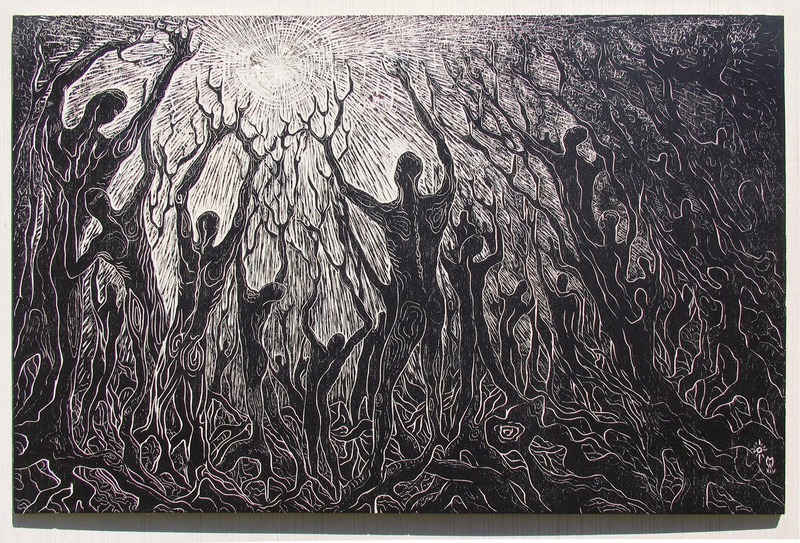 I uploaded a photo album to my Facebook page 1000Woodcuts if you want to see all the blocks together with details. The awesome Nevada Arts Council worker bee came over a couple of days ago and picked up 5 blocks and 5 prints in their tuxedos (black frames) and the show will begin November 1st at the Nevada Arts Council OXS Gallery in Reno Nevada. 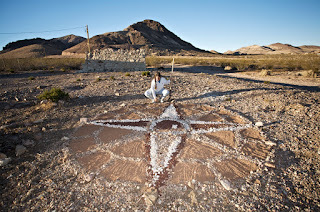 I am planning a drive up there to document the exhibit...or perhaps because I like driving across the desert? 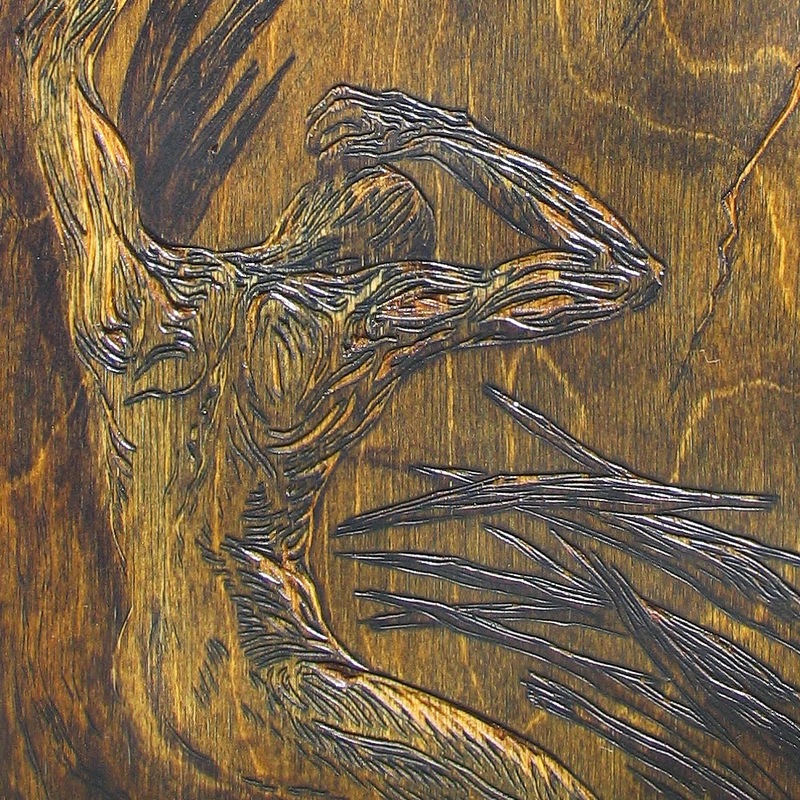 Struck was carved "white line" style, a technique in which the carving is the positive image and the background is inked in black. This is widely used for night scenes where the carved area is "lit". 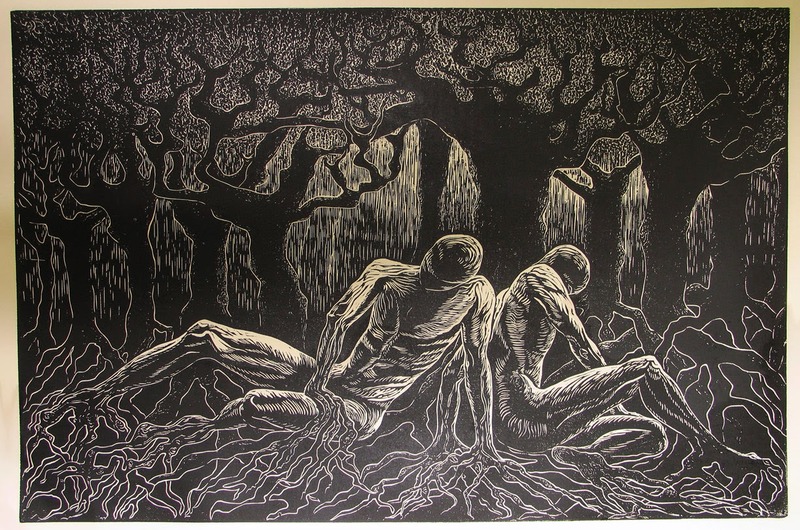 Sort of a reverse reverse woodcut print? 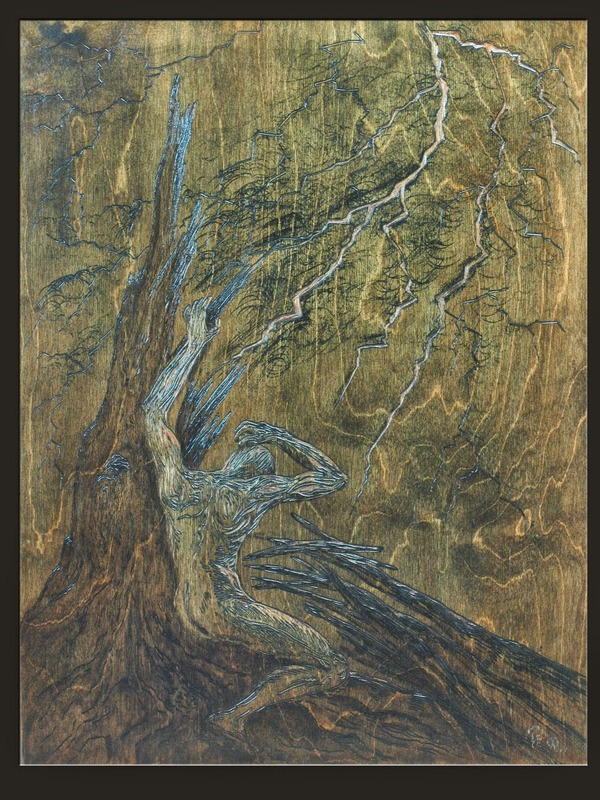 In any case, the lines on this block were carved very fine to show the delicacy of the lightning, and I even used rough sandpaper on the block to make the black sky a bit less black. All the different carving techniques made for a block that was not so exhibit-ready. First step was to strip the old layers of ink with a citrus-based paint stripper. Works quite well and leaves the wood only slightly stained. The stripper is applied, left on for about 30 minutes or longer and then scrapped off with a plastic putty knife so as not to damage the wood. Some old fashioned soap and water follows and the result is a fairly clean block. Most importantly, the carved lines on the figure came up clean. Still, I was not satisfied with the appearance of the block so I decided to experiment with stains. First I stained the whole block lightly with a walnut stain, resulting in some of the lines accepting stain partially. This gave the lines more depth and still the deeper areas remained clean. I rubbed off some areas more than others until I was happy with the result. I stain with sponge brushes and use old socks for rubbing the stain off. With the background solved, the figure didn't stand out enough so I took some rough sandpaper to it and brought the white birch back to life. 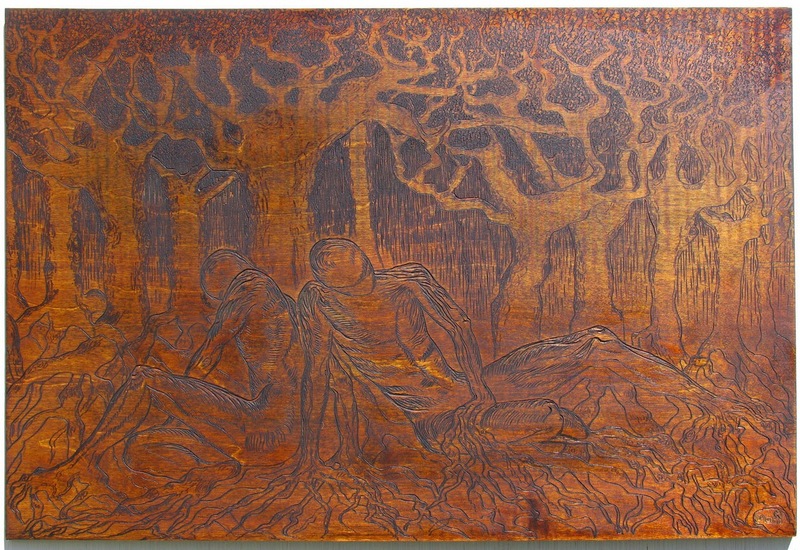 Now with the figure and background contrasting nicely, I thought the tree element needed to be separated from the background so I stained it with a bit of red mahogany, wiping away until the tinge was just different from the background. 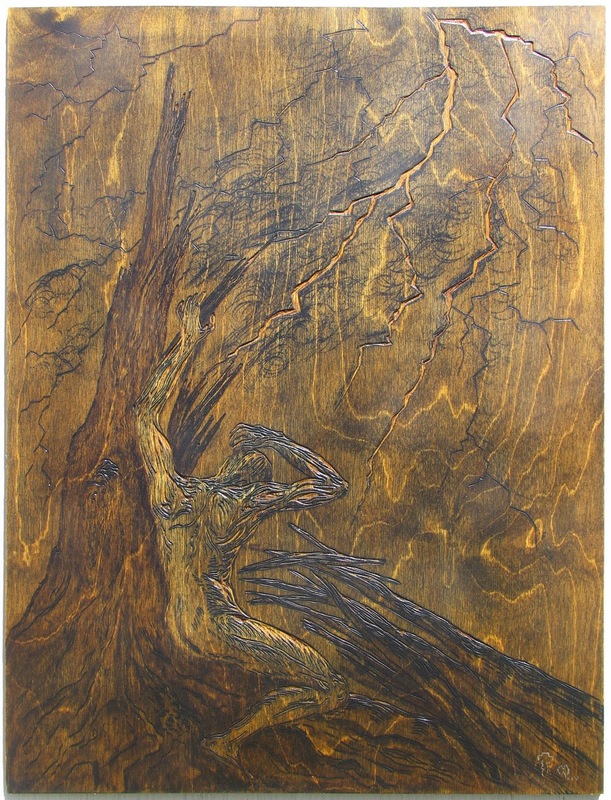 The front "broken" tree needed to be brought toward the viewer so I gave it the same stain as the background but left it a bit darker. Lastly, a nice coat of satin polyurethane over the entire block to eliminate the shine and protect the stain and the bare birch. I have been selling my original woodblocks at art festivals for years and, in getting them ready for "market", I have found that each demands its own particular makeover. Some are ready to sell, they stay clean during printing and all that is required is a few cleanups here and there. Usually cherry and maple blocks are very well behaved. Lines stay clear, ink goes only where it is rolled and the backgrounds remain beautifully carved, clean and showing all the scars of the cutting process. Few...and far between! 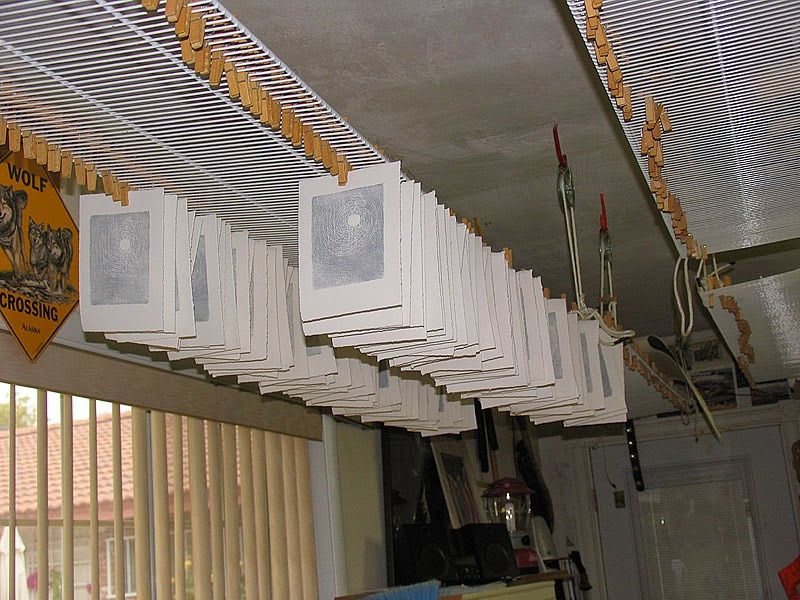 I usually simply let the last layer of ink dry after printing the last print of the edition. 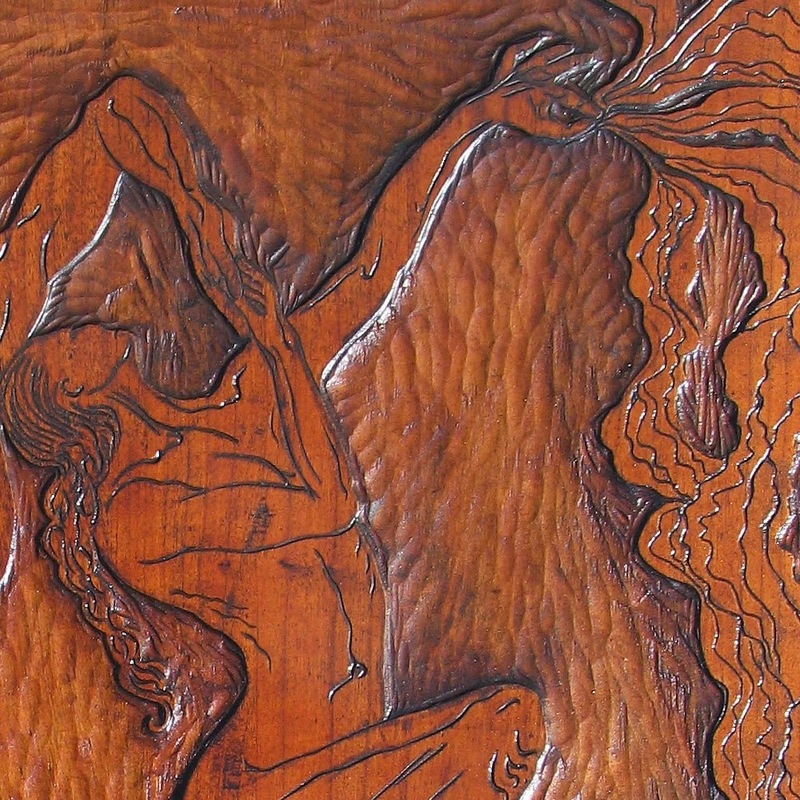 Then I carve my signature or chop and often add a symbol with a metaphor to the image. Lastly I cover with a protective coating, sometimes polyurethane, sometimes a polycrylic, sprayed or brushed but just enough so that the carving scars show. The intent with the signature and the coating is to cancel the block so that fine lines fill in and no more prints could possibly be made from the block, resulting in a one-of-a-kind work. Wouldn't you know it, these two baltic birch blocks were definitely NOT well behaved. 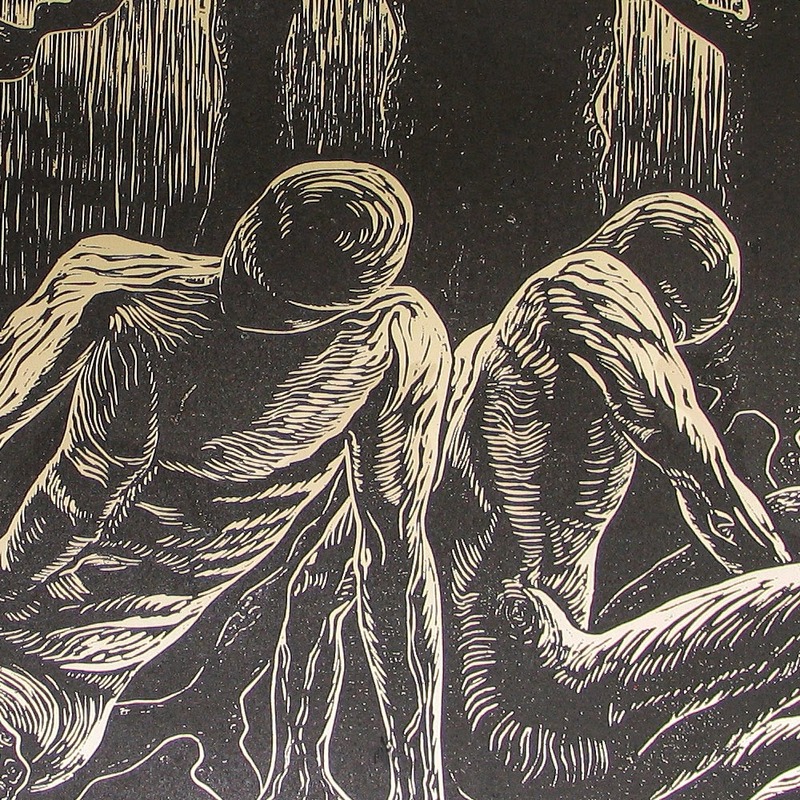 By the time the edition was finished the lines were soft, the backgrounds were soiled and some of the plywood had actually started to fall apart. When blocks misbehave I still have to make them presentable enough to exhibit or sell. The last resort is to stain or paint the entire block with an opaque coating, let dry and then roll up with ink as for printing. These have the "cleaner" look but the downside is that the natural wood is completely covered with something opaque, usually acrylic paint or water-based ink. I try to match the original color of the wood but something about painting wood seems almost sacrilegious. In any case, the blocks with a detail or two for Maze and Light Seekers. The Maze block was cut originally with a scroll saw to make printing easier so I wouldn't have to worry about inking the background between the delicate areas. 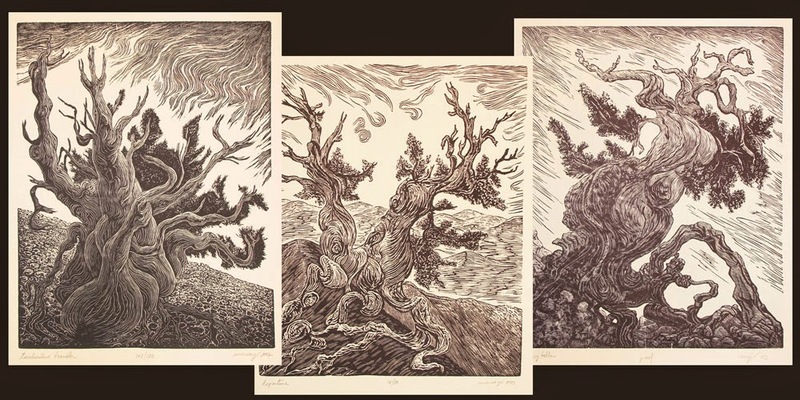 It's been a very busy three weeks but I am now finished printing the remaining editions of the five OXS Exhibit prints at the Nevada Arts Council in Reno, Nevada. I am half planning a little crowd funding project to help frame the exhibit and get myself up there but that's to come in a couple of weeks. Tiny originals, anyone? Printing older works brings mixed feelings. On the one hand I am SO done with those images...but on the other I can't help myself and usually tweak the image just a bit. 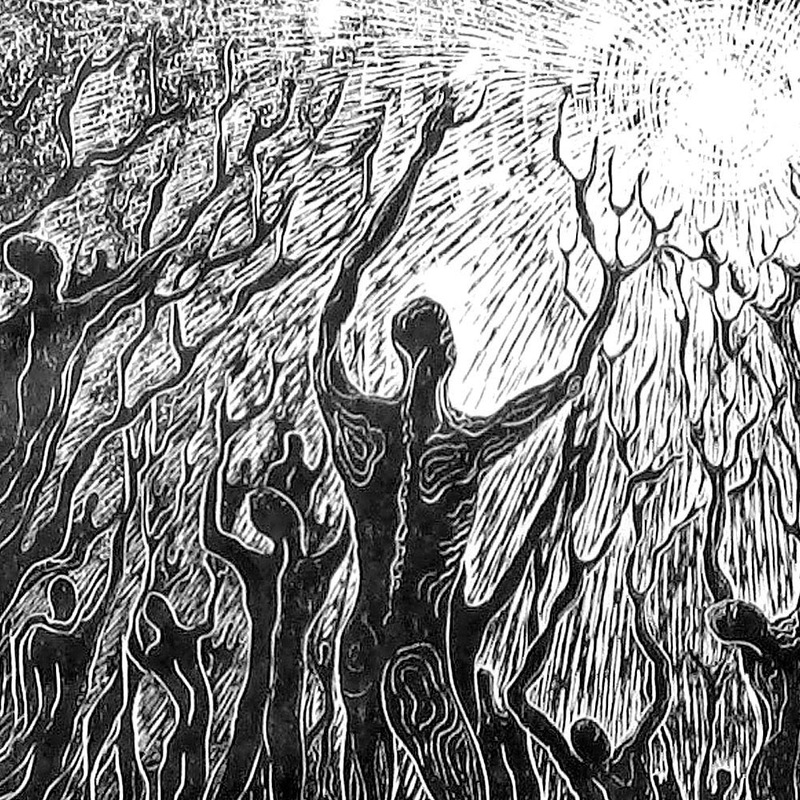 Obviously with woodcuts I can't "add" anything but many times I open up an area, change the outline, clear up some confusion and so on. I did that this time so all the prints have been somewhat redefined to meet my current artistic mood. Subtle changes! The work is now done. Some blocks didn't hold up to my initial edition projection, which I find happens often. Birch, birch, birch...breaks up, softens up, muddies up... Cherry, on the other hand, does just beautifully under my press or hand. 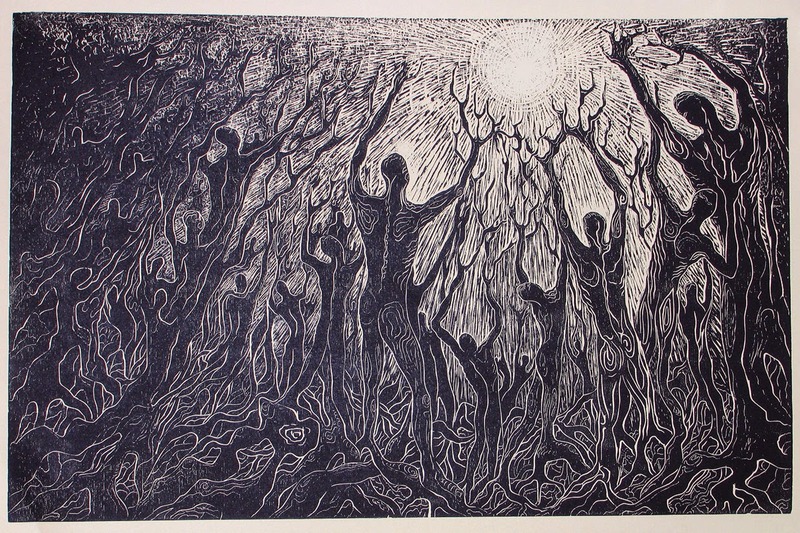 An image inspired by a forest and all the trees and plants reaching for the sun. Someone at a festival called it "very spiritual", others find it enlightening, yet others dark. 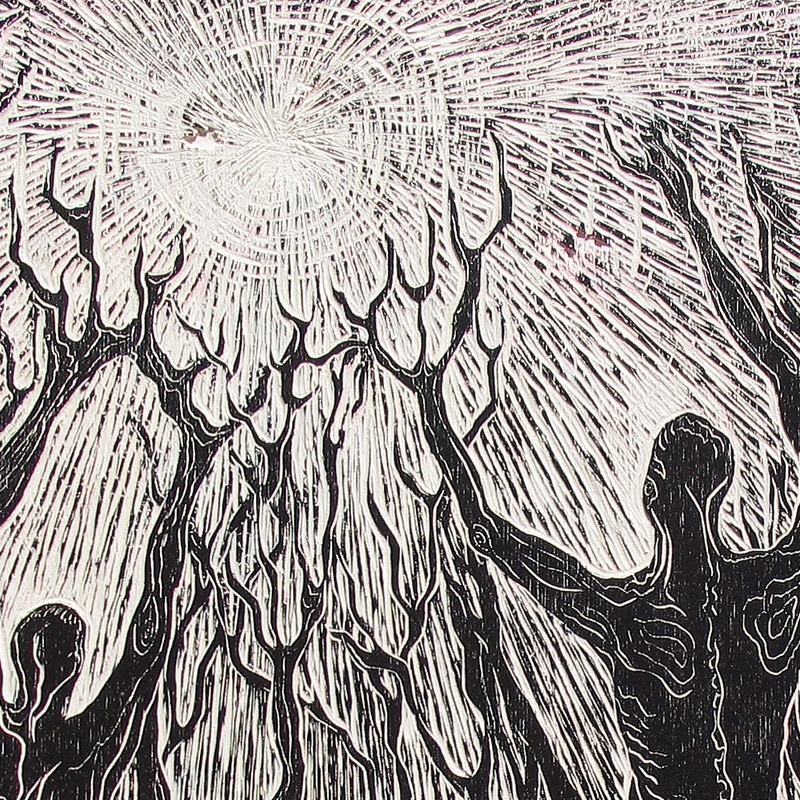 I picked a birch block with a strange knot in it and made it the sun; the figures just seemed to reach for it. Just a sneak peek at some of the blocks getting a makeover. I will be posting again on the process to get each block ready for exhibition, but for now, here are some pictures of the precious things. Only one more print to get ready for the upcoming exhibit at the OXS Gallery in Nevada! These larger prints make me wonder what the heck was I thinking when I decided to go big. Miniatures! next life... But the "big ones" do tend to give me a sense of satisfaction and achievement. They take much energy and work to complete, especially when that other Maria decided to entertain large editions. Really? Anyhow, this particular image, Uprooted along with Struck happen to be two of my most heartfelt. 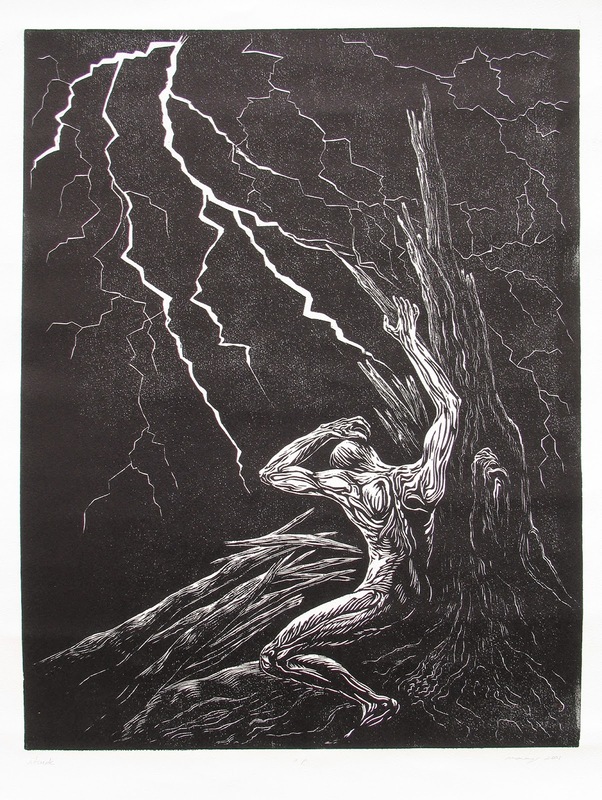 Last week I finished printing an image called Struck. In 1998 or thereabouts, my father suffered a stroke and subsequently required help to get along life. After seeing him shrunken in a wheelchair in the corner of his apartment, we took him into our home. His brother, then a contractor, built an addition to our house so that he could remain somewhat independent yet allow me to care for him. He was lightly struck, as far as strokes go, retaining most of his abilities to walk with a limp and eventually speak normally. His right hand was near useless. Reading that stroke victims after 70 have a dismal survival rate over two years, I decided to take over his care...as much as he would let me. During the next eleven years I ripped the wheelchair out of his life and exchanged it for a three-wheeled bicycle, later a scooter when the bicycle became impossible to pedal. He was in every sense of the word, independent (read: stubborn). We fought, we yelled, we laughed and in the end I was happy I took on the task of helping him along until the end in 2009. 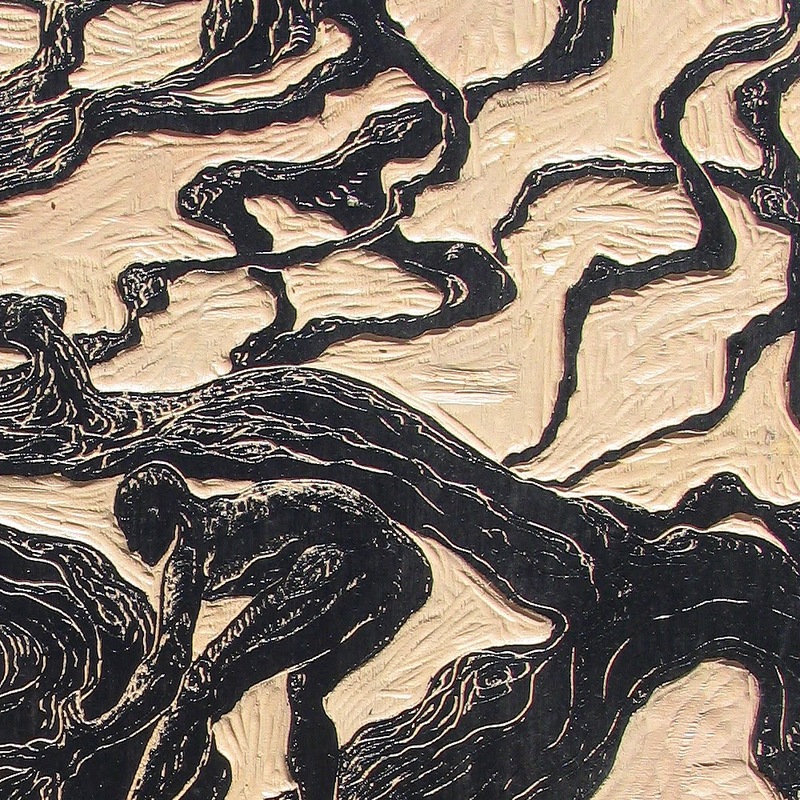 Uprooted is a homage to all those who can't, on any given vacation, revisit their childhood home. In 1974 we immigrated to the US from Spain, but previously my family with a not-quite two year-old Maria, was uprooted from Cuba. I don't remember Cuba at all, but I do remember Spain quite well with very good and happy memories of growing up with the initial help of Las Filipenses, the happiest collection of nuns. A family of five, we left with two suitcases about of the size of today's carry-ons and that still reside in one of my closets. The most salient memory of the trip to the US was that of leaving Barcelona on a train to Madrid, from where we would eventually fly to America. That train left in the dark of night with friends surrounding my parents. I remember someone mentioning that I wasn't crying but the phrase was muffled and distant. Then the train left and I remember entering the darkness of a tunnel. That tunnel has stayed with me, both as a refuge and as a reminder of past places and of hopeful futures. It isn't at all depressing, but merely a place where I felt safe and guarded from distant pasts and unknown futures. Uprooted once more, ready to grow roots in a new place yet never forgetting the last. When I hear people talk about immigrants today, a part of me thinks of that tunnel and I know that they probably have their own safe tunnels where their souls reside temporarily until they can lay root again. Another block printed! Dance, anyone? In my quest to get five prints and blocks ready for the upcoming exhibit at the OXS Gallery, Nevada Arts Council, I am now on image number three with two more to go. This print was a bit more difficult than the last two and so it decided it would take up two days of my precious time. So be it, after all, I am the one who chose the finicky paper. Revisiting an older image is always interesting. I designed this particular image, to the tunes of Flamenco that I often listen to while working. In those days, I would join two pieces of cherrywood together when I needed a larger board than plank cherry, which has a maximum width of about 12-14 inches. Nearly all the blocks that I joined have aged and unfortunately many of them print with a seam down the middle. So first I needed to fix that problem, with masking tape along the back to raise the seam and force it to take ink. After a few prints, the seam was unnoticeable. Then there is the paper! In them days I would pick up papers from all over the world, often at a bargain price from some little papermaking operation tucked in some tiny town. This particular batch of Banana Bark paper from Thailand (I think) was nicely made, the sheets are huge and have some interesting inclusions of bark and tree fiber. These inclusions cause problems, however, and I had forgotten how finicky this paper prints. It is cotton based and slightly stiff and tends to "shed" inclusions and cotton fibers all over the block when submitted to pressure. Sigh. This means the printmaker has to stop and clean off the entire block every 4-5 prints, making for a very long, very dirty day at the press. Wouldn't trade it for anything else, though, the paper is delicious! The texture and inclusions make every print totally unique and the variations within the paper sheet is perfectly suited to the wild flamenco dance. Ole! Persistence, a strong back and a high tolerance for dirty fingernails eventually wins the day and I am now finished with this block and on to the next two. OXS Gallery Exhibit prep work! This has been a very busy year and I am grateful for all the invites and acceptances from galleries and venues in Nevada. I have previously exhibited quite a bit in various places across the US and across the globe, but this year I am proudly being shown in Nevada! Aside from feeling good about it, I am also working like a madwoman! Getting artwork ready for an exhibit takes much excitement, preparation, time and money. 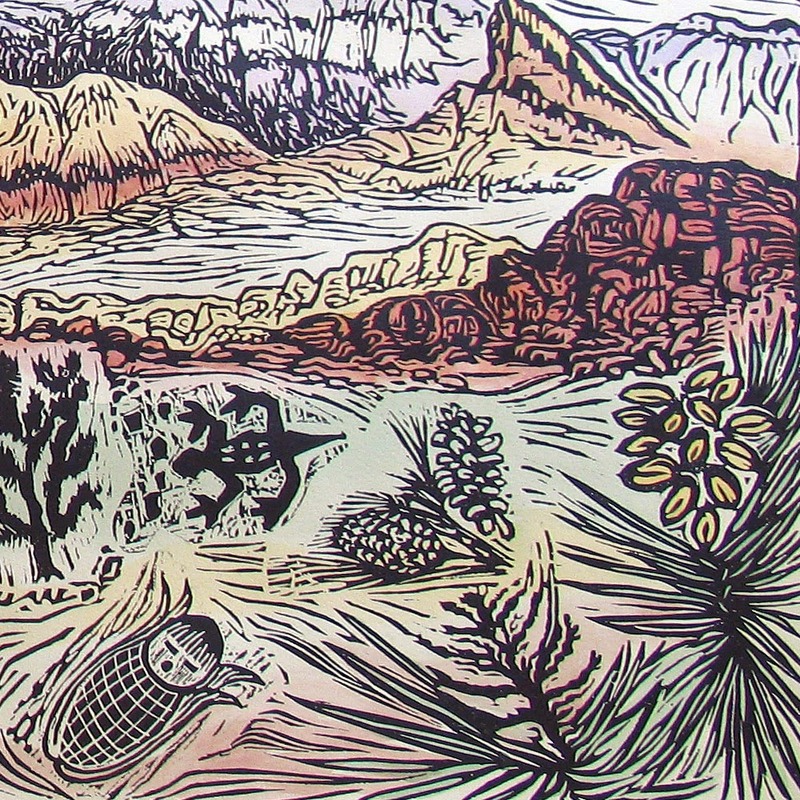 So later this year, November 10, 2014 – January 23, 2015, the Nevada Arts Council has invited me to exhibit along with a fellow artist in the OXS Gallery space in Reno, Nevada. Details will come later as to location and such but for now, I am happily working to get the chosen works prepared. 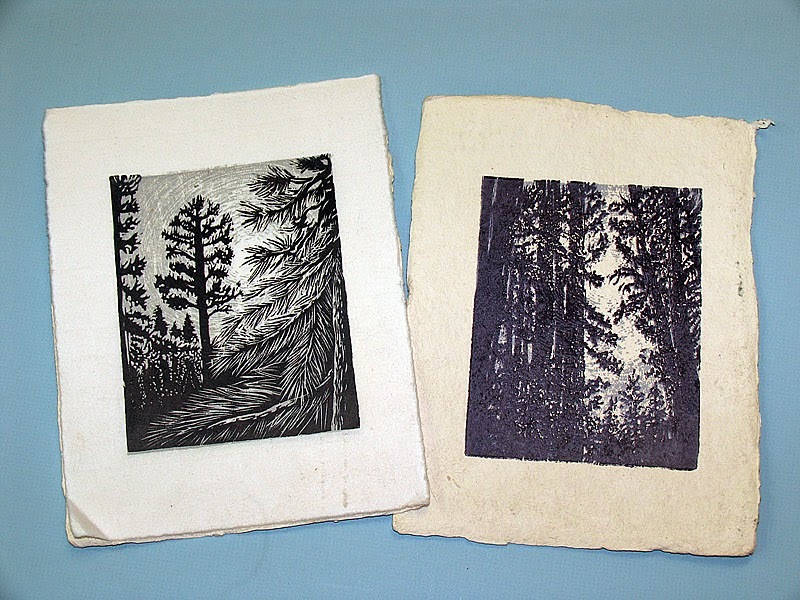 I will be showing 5 woodcuts along with their blocks. Now, as a background, in the past I have only printed a few of each edition as I finished an image. Two reasons for this, one is that I usually have several "irons on the fire" and simply can't take the time to spend three days to a week printing 100 or more prints. Second reason is that I very rarely am I in a position to be able to afford the required paper. I guess a third reason would be that if I had printed all the prints in every edition of all my images so far I would need a few more flat files! So in order to show the blocks, they have to be cleaned up and in order to have the block cleaned up I have to be finished with the edition printing. 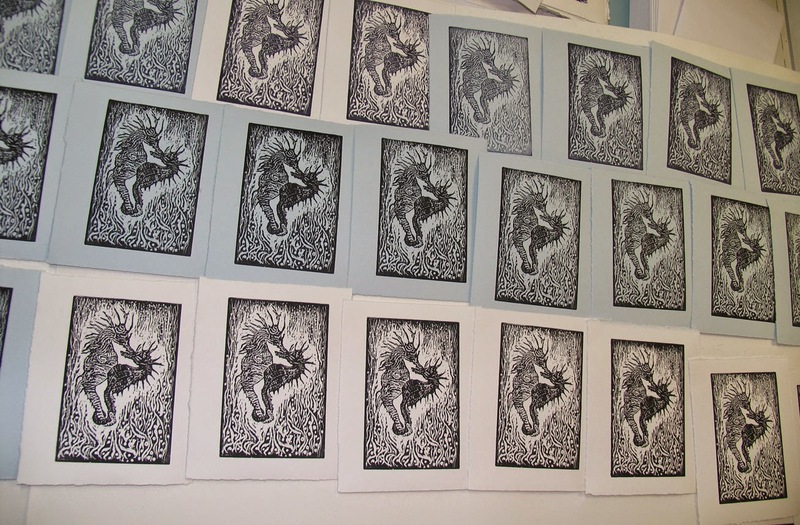 As soon as the curator for the OXS Gallery show decided on the pieces to show, I got busy with a printing marathon! I am now finished with two out of the five blocks and taking a breather until next week. A fresh batch of paper arrived yesterday and I have the third block all ready to go. My press-cranking arm is getting a workout! 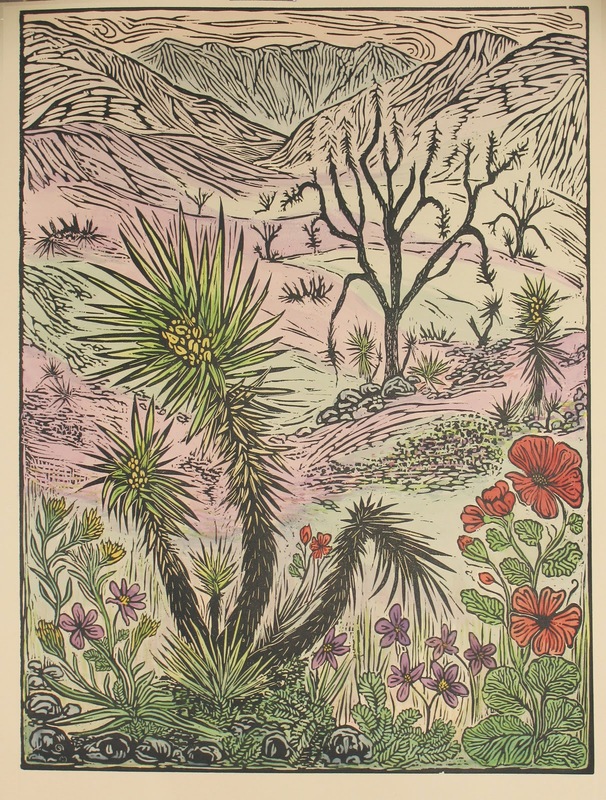 Puzzle Prints traveled to the Laughlin Library in Laughlin Nevada, and will show there through July, courtesy the Las Vegas/Clark County Library District. 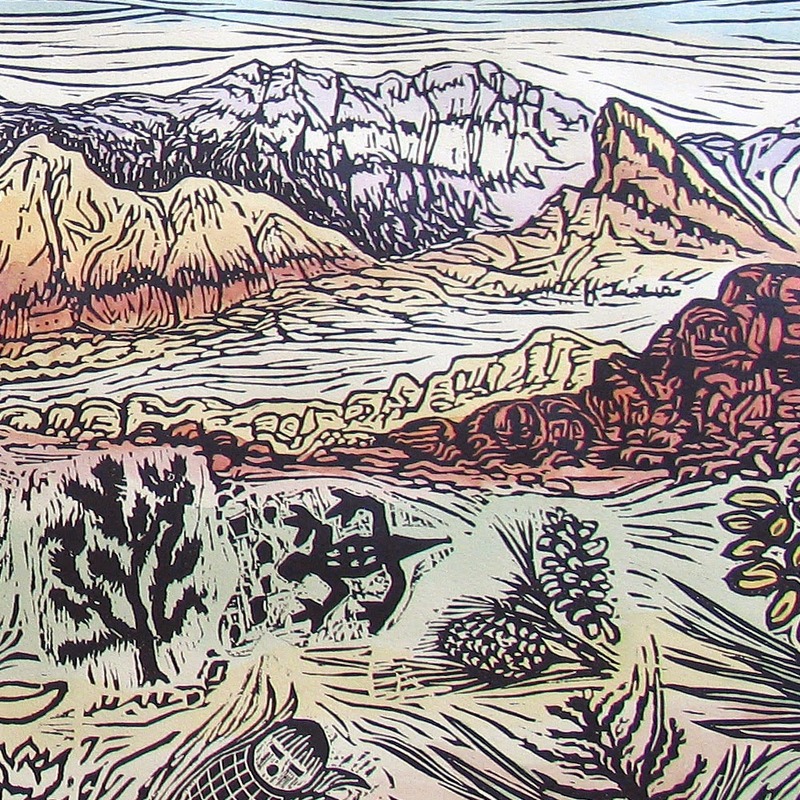 A Closer Look, the collaborative print made during my residency at Red Rock Canyon, will be shown along with other woodcuts in a 3-artist-show at the Red Rock Canyon Visitor's Center just West of Las Vegas, beginning July 4th. Opening reception is July 9th 5-7 PM! 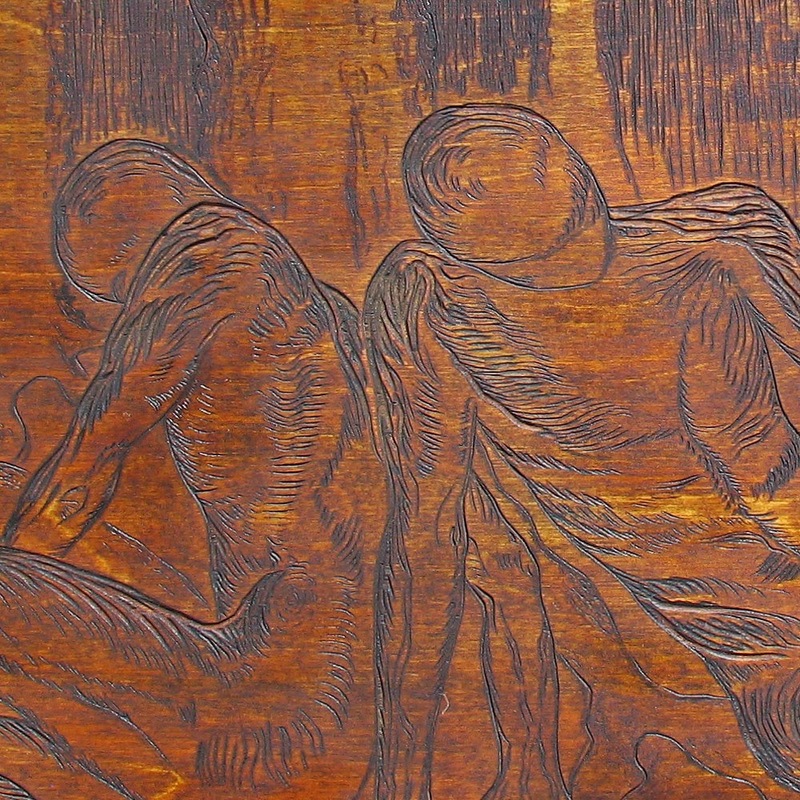 Two engravings will show in Why, Masterworks? An educational exhibit in the Fifth Street School, 401 S 4th in downtown Las Vegas. 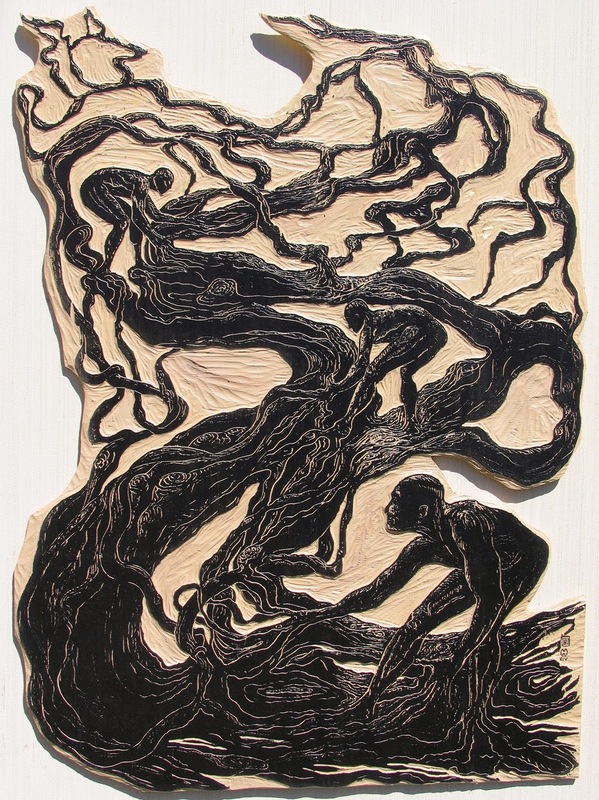 And the Celebrating Life 2014 Exhibit will continue until mid July in the Charleston Heights Art Center, my piece After the Fire was awarded First Prize in Mixed Media. The Winners' Circle Show will continue in the City Hall Chamber Gallery but I will post dates when it gets closer. 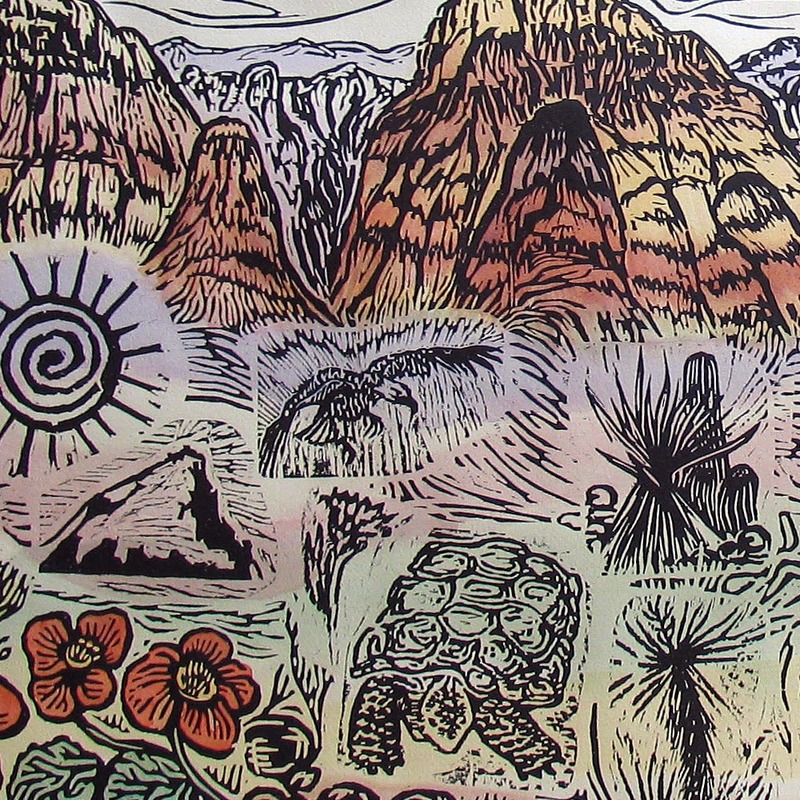 After printing, the woodblock for Red Rock Canyon: A Closer Look puzzle print was a bit dirty. They all are, really! That pesky ink gets everywhere. If I have a plank block that needs to be exhibited or go out to market, I usually just recarve the soiled portions. Then I roll a fresh coat of ink on the relief, and sometimes cover the whole thing with thick polyurethane to "cancel" the block. 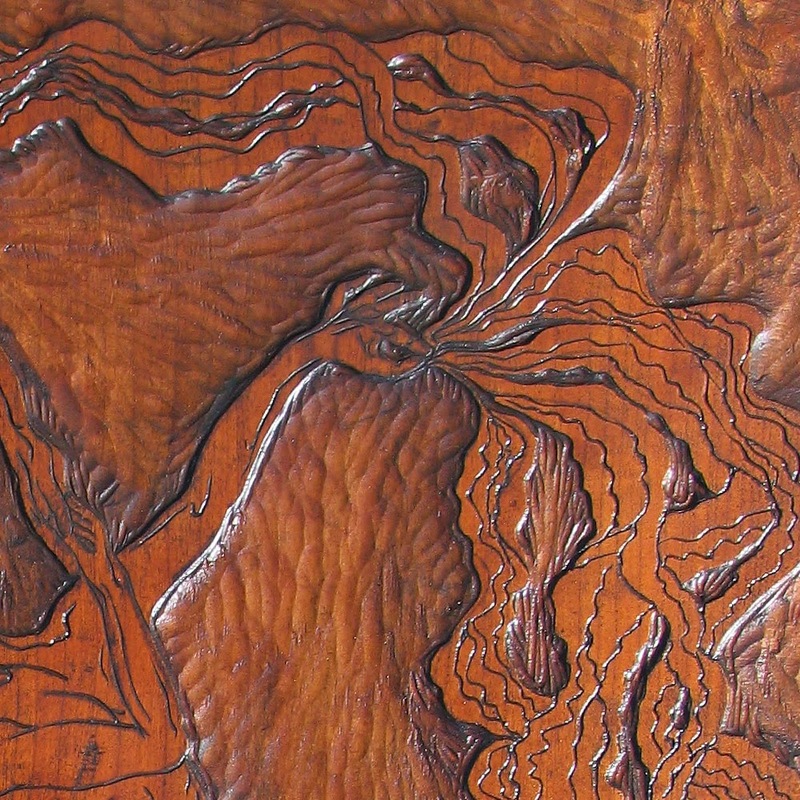 I carve my signature somewhere visible prior to the polyurethane treatment. But plywood presents a problem, especially Shina plywood. Carving the soiled inky parts sometimes uncovers an alternate universe...er, I mean an additional layer of ply that isn't quite as attractive as the top layer. 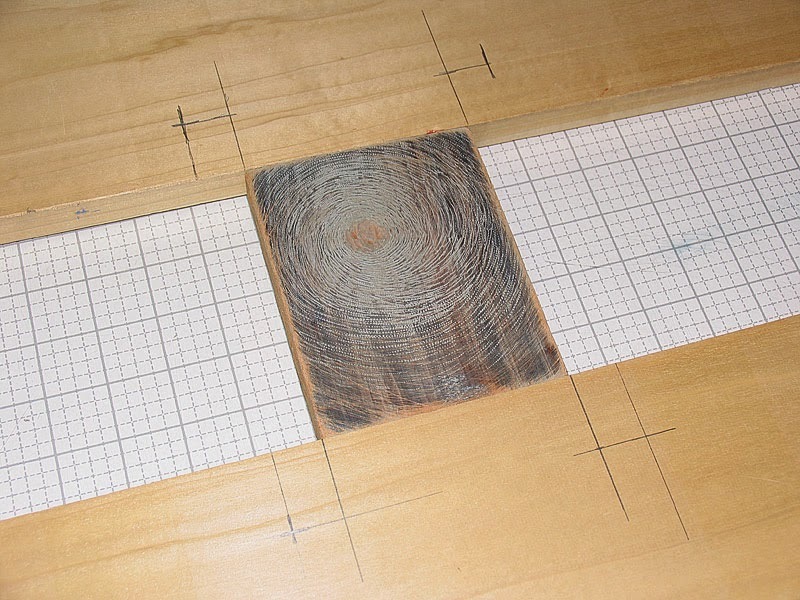 So when I finish a plywood wood block, I use another method. Rather than explain, I made a slide show. With block and prints now complete, time to start another project! 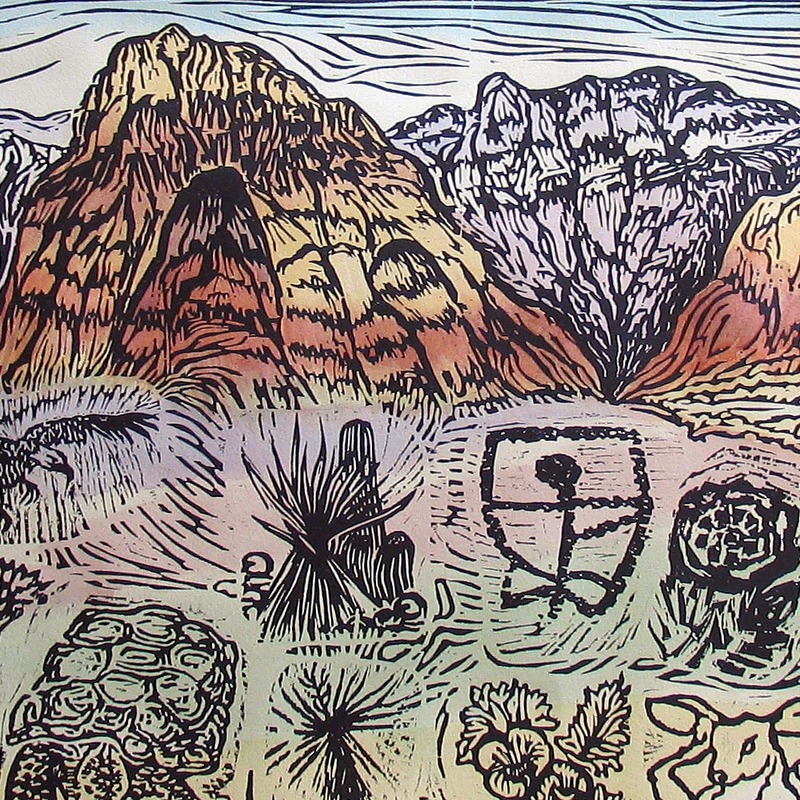 Finished the Red Rock Canyon puzzle print! Coloring a woodcut with watercolors is fun but also stressful. The print takes about 20 minutes to print and an $8 piece of paper and messing up is really not an option. After the first one, though, seems like the stress is gone and I enjoy playing with very dilute watercolors. The first one requires that every color is mixed to "taste" both in hue and saturation so it takes a little while to get that first one done. After that, I just paint as many as I can until I run out of color. I can usually work on two at a time but this one was too big. Nevertheless, I finished two and hopefully my mixes stay wet until tomorrow under the lid of the palette. The budding artists participated in my workshop and each received a tiny block. It was later my job to fit all the blocks into the overall composition. A slightly different approach to the puzzle print concept but it worked well. The overall has a real primitive feel, I think, and is reminiscent of some of the petroglyph imagery found around these parts. Amazing all that you might find when you take a closer look! From left to right on the little blocks, or from Sun to Pine Cones if you prefer. Block is next in line to get cleaned up and sealed. Here is the finished print and some details.